United did not have a shot on target in their 1-0 defeat against the La Liga side, who effectively stopped playing after banking their first-half away goal. When Lionel Messi booted the ball out of play while trying to find Jordi Alba on 55 minutes, not only was it a rub-your-eyes moment, it also highlighted the possibilities on the table for United. However, Ole Gunnar Solskjaer's men did not possess the maturity or quality in the final third to punish Barcelona's sloppiness. It was Luke Shaw's first-half own goal that handed Barcelona the advantage as United suffered a frustrating 1-0 defeat in their Champions League quarter-final first leg at Old Trafford. The endeavour could not be questioned. Scott McTominay, Diogo Dalot and Chris Smalling all did their bit for the cause but where there was sweat, there was also plenty of fret, especially in front goal. Manchester United failed to have a single shot on target in a Champions League game for the first time since March 2005, in a 0-1 loss at AC Milan. On the flip side, their struggles, especially in wide areas, will help Solskjaer in his pitch to the United board over the summer regarding transfer funds. Major surgery could be required. On this showing, they are perhaps further away from the level required of Europe's elite than Solskjaer's early results had suggested. Barcelona put their cue on the rack and United could not take advantage. The pre-match vibes suggested Messi was about to leave his footprint of greatness on Old Trafford - a stadium he has only graced once in the Champions League. It was not a happy memory either as in 2008 he was on the losing side as Barca were beaten over two legs by Sir Alex Ferguson's United courtesy of a Paul Scholes strike. Those tuning in to see a masterclass - like the one he put on against Tottenham at Wembley earlier this season - would have been getting giddy inside 20 minutes. Messi was doing Messi things. His clever run over the top and silky no-look cross for Suarez provided the opening goal while his close control was too much for Luke Shaw, who picked up a booking, and Fred, who was put on his backside. United were standing off and admiring him at times - a notion admitted by Scott McTominay in his post-match interview. But then came the wallop. Chris Smalling provided it on halfway as he thumped into a 50-50 and accidentally caught Messi flush on his nose. It was a cut that drew plenty of blood. Messi wasn't the same from that moment on. He was shaken. To steal Ian Wright's analogy when describing England's defeat against Iceland at the 2016 European Champions: it was like Messi's talent was stolen by aliens, like in the film Space Jam starring Michael Jordan. His misplaced pass out to Alba was followed minutes later by being outmuscled again by Smalling before fouling Paul Pogba in frustration. At full-time, Messi had squandered possession 19 times and won just 30 per cent of his duels. Smalling had probably won the battle. 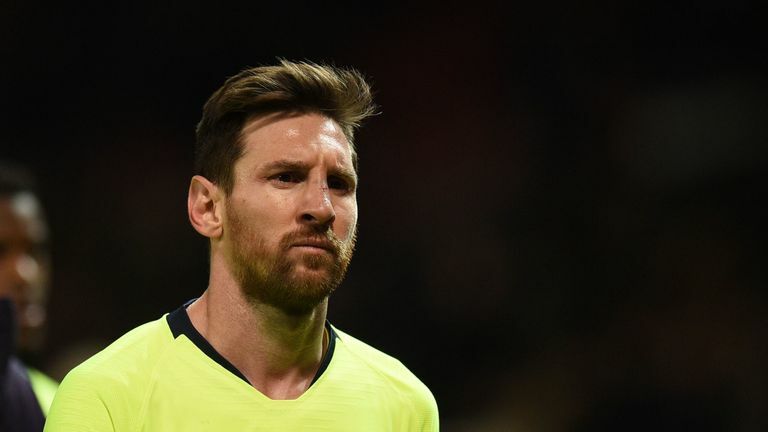 Strangely, Messi has now failed to score in any of his last 12 Champions League quarter-final appearances for Barcelona, since netting against PSG in April 2013. His one effort on goal at Old Trafford took his tally up to 50 shots without a goal at this stage of the competition. Lionel Messi's the greatest footballer of all time, according to pundits Ally McCoist and Matt Murray. In fact, there was only one player more guilty of giving the ball away on the pitch than Messi as Ashley Young squandered possession 30 times - many of them in dangerous attacking positions. It wasn't a surprise to see Messi locate himself for the majority of the match down Barcelona's left. It was a clear exploitation tactic from the Spaniards to target Young with left-back Jordi Alba's involvement clear to see as no other player had more touches of the ball in the first half (55). Ernesto Valverde was obviously watching United's defeat at Wolves where Young was the key weak link - a performance that saw him dismissed for two yellow cards and squander possession 19 times. Here, Young looked way below the standard required from an attacking full-back in the modern era. Despite being full of endeavour and enthusiasm, his distribution in the final third left his front men throwing their hands in the air in frustration. On a rare occasion where United turned the Barca backline in the first half, Young had Rashford free in the middle but his final ball had fans ducking for cover in the East Stand. It was one of many wasteful final balls. Perhaps it's a confidence issue or are Young's powers diminishing? It's certainly an area Solskjaer must address in the summer if he wants to take United back to the top table. The performance of his opposite number Nelson Semedo, who was bright, energetic and full of quality with his final ball, gives Solskjaer a fair idea of the level which is required. Certainly, Young and his teammates will need to improve their quality at the Nou Camp. United live to fight another day but this felt like a missed opportunity.